August (Aug.) is the 8th month of the year in the Gregorian calendar, coming between July and September. It has 31 days, the same number of days as the previous month, July, and is named after Roman Emperor Augustus Caesar. August doesn't begin on the same day of the week as any other month in common years, but begins on the same day of the week as February in leap years. August always ends on the same day of the week as November. This month was first called Sextilis in Latin, because it was the sixth month in the old Roman calendar. The Roman calendar began in March about 735 BC with Romulus. October was the eighth month. August was the eighth month when January or February were added to the start of the year by King Numa Pompilius about 700 BC. Or, when those two months were moved from the end to the beginning of the year by the decemvirs about 450 BC (Roman writers disagree). In 153 BC January 1 was determined as the beginning of the year. August is named for Augustus Caesar who became Roman consul in this month. The month has 31 days because Julius Caesar added two days when he created the Julian calendar in 45 BC. August is after July and before September. August, in either hemisphere, is the seasonal equivalent of February in the other. In the Northern hemisphere it is a summer month and it is a winter month in the Southern hemisphere. No other month in common years begins on the same day of the week as August, but August begins on the same day of the week as February in leap years. August ends on the same day of the week as November every year, as each other's last days are 13 weeks (91 days) apart. In common years, August starts on the same day of the week as March and November of the previous year, and in leap years, June of the previous year. In common years, August finishes on the same day of the week as March and June of the previous year, and in leap years, September of the previous year. In common years immediately after other common years, August starts on the same day of the week as February of the previous year. In years immediately before common years, August starts on the same day of the week as May of the following year, and in years immediately before leap years, October of the following year. In years immediately before common years, August finishes on the same day of the week as May of the following year, and in years immediately before leap years, February and October of the following year. Flags celebrating Switzerland's national day on August 1. Military Tattoo at Edinburgh Castle. Edinburgh Festival, including the Military Tattoo at Edinburgh Castle, takes place through most of August and beginning of September. Krakatoa exploded on August 27, 1883. Martin Luther King, Jr. at the March on Washington on August 28, 1963. August 1 – 1291: Traditional founding date of Switzerland. August 1 – 1914: World War I begins. August 1 – 1944: Anne Frank makes the last entry in her diary. August 1 – 1960: Dahomey (now called Benin) becomes independent. August 2 – 1990: Iraq invades Kuwait. August 3 – 1492: Christopher Columbus sets sail on his first voyage. August 3 – 1960: Niger becomes independent. August 4 – 1944: Anne Frank and her family are captured by the Gestapo in Amsterdam. August 4 – 1984: Upper Volta's name is changed to Burkina Faso. August 5 – 1960: Upper Volta becomes independent. August 5 – 1962: Film actress Marilyn Monroe is found dead at her home. August 6 – 1825: Bolivian independence. August 6 – 1945: The Atomic Bomb is dropped on Hiroshima. August 6 – 1962: Jamaica becomes independent. August 7 – 1960: Ivory Coast becomes independent. August 9 – 1945: The Atomic Bomb is dropped on Nagasaki. August 9 – 1965: Singapore becomes independent. August 9 – 1974: US President Richard Nixon resigns following the Watergate scandal, with Gerald Ford replacing him. August 10 – 1809: Beginning of Ecuadorean independence movement. August 11 – 1960: Chad becomes independent. August 13 – 1960: The Central African Republic becomes independent. August 13 – 1961: Building of the Berlin Wall begins. August 14 – 1945: Japan announces its surrender at the end of World War II. August 14/15 – 1947: India is partitioned at independence from the UK, as the new mainly Islamic state of Pakistan is created. August 15 – 1960: The Republic of the Congo becomes independent. August 15 – 1971: Bahrain becomes independent. August 16 – 1977: Elvis Presley dies aged 42, leading to a worldwide outpouring of grief. August 17 – 1945: Indonesia declares independence from the Netherlands. August 17 – 1960: Gabon becomes independent. August 17 – 1962: Peter Fechter becomes the first person to be shot dead at the Berlin Wall. August 19 – 43 BC: Augustus becomes Roman consul. August 19 – 14: Augustus dies. August 19 – 1919: Afghanistan becomes independent. August 19 – 1991: The August Coup against Mikhail Gorbachev, in the Soviet Union, begins. August 20 – 1940: Leon Trotsky is fatally wounded with an ice pick in Mexico. August 20 – 1968: The Prague Spring uprising is crushed. August 20 – 1991: Estonia regains its independence from the Soviet Union. August 21 – 1959: Hawaii becomes the 50th State of the US. August 24 – 79: Vesuvius erupts, destroying Pompeii and neighbouring Herculaneum. August 24 – 1991: Ukraine regains independence from the Soviet Union. August 25 – 1825: Uruguay declares independence from Brazil. August 27 – 1883: Krakatoa, in the Sunda Strait between Sumatra and Java, explodes, after a very violent eruption. August 27 – 1991: Moldova becomes independent from the Soviet Union. 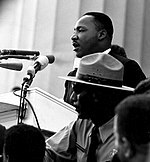 August 28 – 1963: The March on Washington for Jobs and Freedom takes place, where Martin Luther King, Jr. makes his "I Have a Dream" speech for Civil Rights in the United States. August 29 – 2005: Hurricane Katrina wreaks devastation in Alabama, Mississippi and Louisiana. New Orleans is flooded. August 31 – 1957: Malaysia, then the Federation of Malaya, becomes independent. August 31 – 1962: Trinidad and Tobago becomes independent. August 31 – 1991: Kyrgyzstan becomes independent. August 31 – 1997: Diana, Princess of Wales is killed in a car crash in Paris, leading to a big outpouring of grief. August is the only calendar month in the English language that can be a male given name. Along with July, August is one of two calendar months to be named after people who really lived (July was named for Julius Caesar and August was named for Augustus). Only one US President has died in August, Warren G. Harding, on August 2, 1923. August's flower is the Gladiolus with the birthstone being peridot. The astrological signs for August are Leo (July 22 - August 21) and Virgo (August 22 - September 21). This page was last changed on 3 April 2018, at 02:05.